This is an appropriate question, since it is rumoured that couples creep up to the Cerne Abbas Giant at night in order to make babies. As the Giant is cut into a hill with a reasonable degree of slope on it, the mechanics of their actions must be somewhat of a challenge; but each to their own. We should hope these nocturnal visits are coordinated so as to ensure fair use, only one couple at a time and no queuing. The reason it (allegedly) happens at all is because some see the figure as a fertility symbol; I can’t imagine why. Some people believe the Giant represents an ancient Celtic deity, or Hercules. Actually, the age of the Cerne Abbas Giant is uncertain; although it is given the benefit of the doubt and listed by A Bit About Britain as prehistoric, it may have been cut as recently as the 17th century. There is some evidence that the Giant once had a cloak casually slung over the left arm – Hercules is often depicted with a lion skin over his arm – and a further suggestion that he once carried a severed head in his left hand. If the Giant is some 2,000 years old, as some think, then a severed head would chime with the image of an Iron Age warrior, or god, returning from battle with his enemy’s head as a prize. Advocates of the 17th-century school of thought, however, point out that the earliest reference to the Giant is from 1694, that there is no reference to the Giant in any of the surviving records from nearby Cerne Abbey, and speculate that it is a malicious representation of Oliver Cromwell, who did not endear himself to a local landowner. If so, there was obviously more to Cromwell than the history books usually tell us. 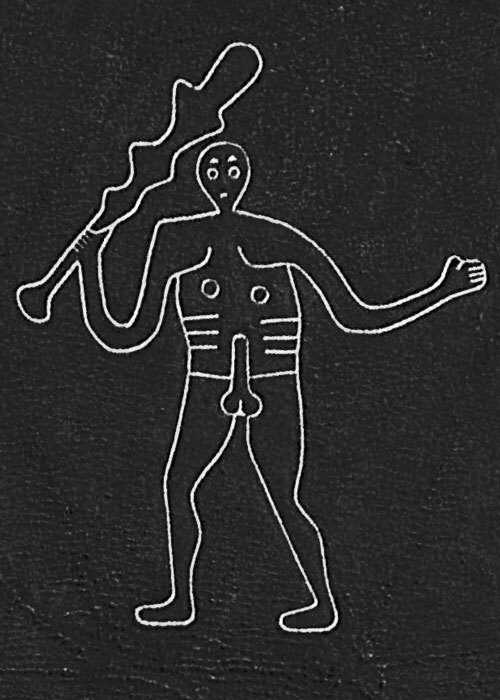 I may as well mention that there’s a local legend that a Giant was killed on the hill and the good folk of Cerne Abbas marked round the body to preserve its outline. Are we to assume, then, that the Giant died happy? Like all hillside figures, the Giant gets all furry and indistinct if he is not regularly attended to – a process known as scouring, which the locals must have been carrying out since at least the 17th century. During the Second World War, he was covered, not to avoid embarrassment to innocent Luftwaffe crews, but so they could not use him as a landmark. As if. Unsurprisingly, the Giant is also subject to various pranks and modifications, some of them amusing. Apparently, an American comic featuring our hero in 2015 had to censor itself, because some outlets refused to stock issues showing him au naturel. A spokesperson for the National Trust, which owns and manages this national treasure, blandly said that they “like him as he is” and had never censored him. More depressingly, the logo of Cerne Abbas Brewery, which predictably features our little friend, was partly covered with a paper fig-leaf when their ale went on sale in a bar at the Houses of Parliament. Eagle-eyed readers will have spotted some sort of earthwork just above the Giant’s left shoulder. Known as ‘the Frying Pan’ or ‘the Trendle’ (no, I don’t), this feature might actually be quite old. 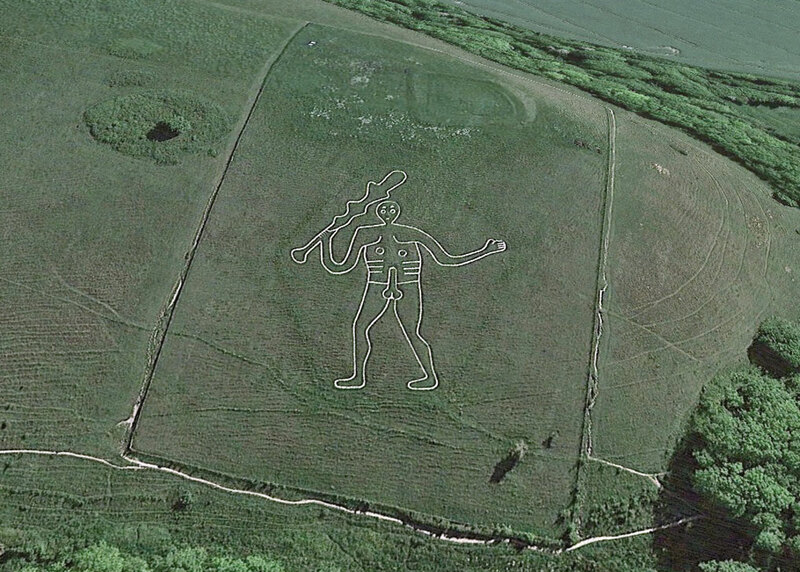 Anyway, the easiest place to see the Cerne Abbas Giant is from a full-frontal unguarded viewing point on the east side of the A352, just north of Cerne Abbas village. The last time I was there, the poor chap seemed in need of a good scouring, so my shots are pretty useless. Of course, he is best seen from the air anyway so, to show him off in his full glory, I have taken some images from Google Earth. No disrespect intended. My first impression was a sort of pre-historic cricket player. Which immediately led me to the conclusion he was a warrior of some sort. We have several types of Mesoamerican and Native American warrior practices that evolved into modern games. Haha! Anyway, I would always like to think it was the more ancient date, but then even experts were fooled into thinking that some sculptures thrown off a bridge by clever teenagers in Vienna some years back were genuine ancient artifacts. Reminds me of Chesterton’s essay, ‘A Piece of Chalk,’ minus illustration. Now you’ve got me thinking ‘prehistoric teaching methods’! Interesting story, never heard of this before. I’m surprised that so many hadn’t heard of him. There are certainly a good number of strange, interesting and very old things still hanging around in your country! I never knew he had to be cleaned up periodically – it’s rather amazing that the locals have always attended to this. Do you really think he’s prehistoric? It seems more like something that would have been made way, way back, rather than in the relatively recent 17th century. But I’m no archaeologist. I was having a beer with some of those strange, interesting, old things just the other day… I don’t know – it fits more in a prehistoric context, doesn’t it, but it’s odd that there are no earlier records. I guess they need to find some Iron Age tools at the bottom of the trench or something. I have never seen him in the flesh (or should that be chalk). But I have read that certain of his current attributes are not authentic and have been augmented and enlarged from his original status on the hillside. What some people will do, eh?! Wonderful piece, full of humour as always, Mike. Thanks, Frank – hope it made you smile. It was Royalists Cromwell had a problem with, though. Thanks for this post and the best place to view! Had to laugh at the last paragraph. Enjoy your weekend – wherever in Britain you may be visiting! A good man is hard to find . . .
And our friend here doesn’t answer back. Hahahaah I love the last bit! I’ll have to try and get to this one, although I feel like it’s better to try and see him from above! At least they didn’t need scaffolding. At least, I hope they didn’t. Of course you know that I know the Long Man of Wilmington in Sussex! That one is more PG rated, if you get my meaning! So glad that the locals keep these looking good. I know you said it needed a good cleaning, but hey, at least it is protected and will be around for years to come, hopefully! I’ll feature the Long Man sometime just for you, Kay! I think that’s the first I’ve heard of him. 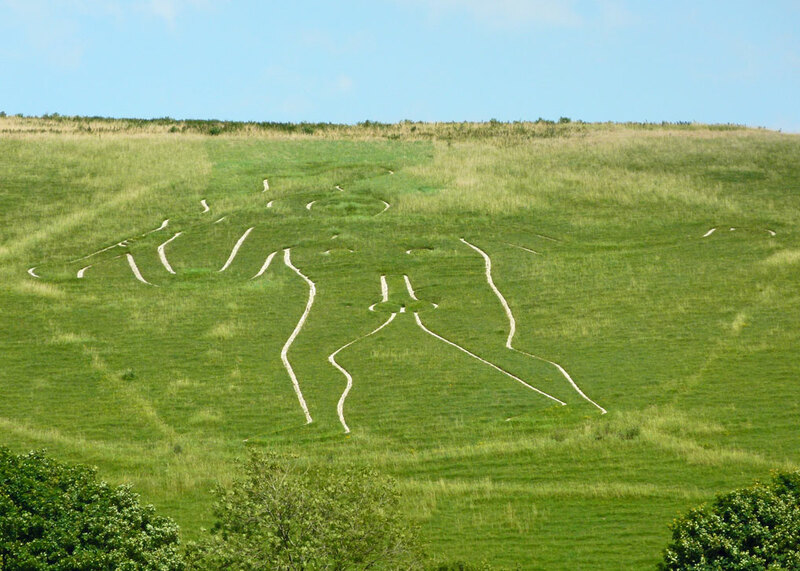 I have just been reading about the Cerne Abbas Giant so your post is timely. I find it fascinating and would love to see it one day. I love the last lines!! Great post Mike​, never seen him in the flesh, so to speak. I never heard of this one, either. Thanks for an interesting article. “As the Giant is cut into a hill with a reasonable degree of slope on it, the mechanics of their actions must be somewhat of a challenge…” I always appreciate a good belly laugh, Mike. Many thanks for that one. So weird, I’ve never heard of this one before. It’s a bit funny that folks go there to make babies! Recently re-erected? LOL! !